It has been another ridiculous hot fortnight here in England with the mercury hitting the high 30’s. When I was told I would be doing my internship in the UK I was not expecting this sort of weather. I thought it would be cooler. On the bright side, I know I will be well prepared for the summer when I return home. In the last fortnight I have been working a lot on the Jacobson Triple Mower and the Dennis Premier Cylinder Mower. I am slowly getting the hang of the Dennis mower. Though when you are mowing a pitch that has a lot of pull in the pattern they can be quite challenging. As for the triple mower I am enjoying being able to practice my accuracy and getting that nice straight line between the panels. It isn’t always great but practice and perseverance will get me there.I have been at Arsenal now a month and feel as though I am doing really well. I am happy with the feedback I am getting from the boys and continually working on improving. 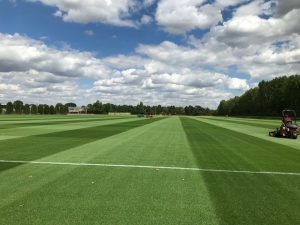 At the London Colney Training Facility there is 11 pitches all with a different profiles. There are two pitches which are a sand soil base profile. 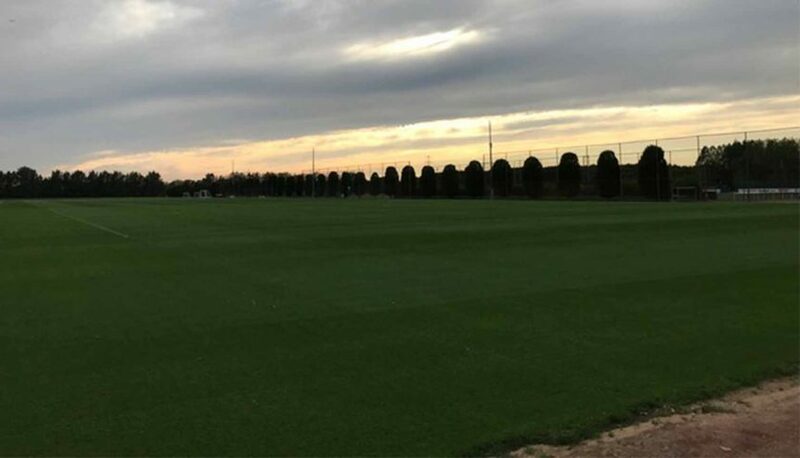 There is one pitch which is made of a combination of recycled playing profiles from when the Emirates Stadium and London Olympic Stadium got resurfaced. There is 6 pitches which have Desso Grassmaster and 2 pitches which are made up of AirFibr. AirFibr is an interesting concept and one that I like the idea of. It is made in France and was originally designed for equestrian. It is a fine sand based mixture with microfibers intertwined through it, and allows natural turf to grow in it. The natural granulated cork is an integral part of the makeup of this profile and creates a soft resilient surface which helps with optimal player safety. Another benefit of AirFibr is that it has a higher retention rate for liquid, this includes water, fertilisers etc. AirFibr has been researched and trialled on a number of high end sports fields and stadiums along with multi – purpose stadiums. At Arsenal, Steve is trialling the AirFibr currently on two pitches. In my time so far I have seen some of the benefits of Airfibr in water restricted areas. There have also been studies on showing how AirFibr can reduce contactless injuries that occur on sporting fields. I am enjoying being able to learn about such products that are available in the industry. This experience has been an eye opener for me. 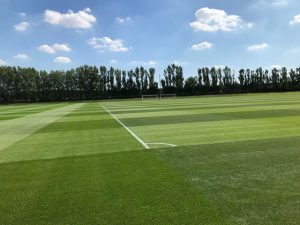 We have currently started a renovation on one of the first team pitches, I am look forward to seeing how a renovation is carried out, as I am aware that we will try and take a different approach to how the process is conducted. Each individual field renovation will vary depending on a number of factors. I.e. playing profile, weather etc.